Based upon careful scientific research and logical deduction, this is a book for all who have an interest in the nature of the reality in which they exist. My Big TOE is not only about scientific theory, function, process, and discovery - but also speaks to each individual reader about their innate capabilities. Readers will learn to appreciate that their human potential stretches far beyond the limitations of the physical universe. This trilogy delivers the next major scientific conceptual breakthrough since relativity and quantum mechanics raised scientific eyebrows in the first half of the twentieth century. No catch, no megalomania, no hypothetical wackiness, no goofy beliefs, no unusual assumptions - just straightforward science that better describes the totality of our experience and provides a wealth of practical results and new understanding that can be applied personally and professionally by scientists and nonscientists alike. This is the real thing. My Big TOE is about life, purpose, personal significance, physics, evolution, and the reason why. The acronym "TOE" is a standard term in the physics community that stands for "Theory Of Everything." Such a theory has been the "Holy Grail" of physicists for more than fifty years. My Big TOE delivers the solution to that scientific quest at the layman's level with precision and clarity. This book is an adventure into the overlapping worlds of science, philosophy, and metaphysics. It is tightly analytical and logical as all good works of science and philosophy should be, while at the same time down to earth, easily understandable, and full of good humor. No leaps of faith or beliefs of any sort are required to get to where these books will take you. Campbell did not put the "My" in My Big TOE to flaunt pride of authorship. Nor does the "My" indicate any lack of generality or applicability to others. The "My" was added to be a constant reminder to you that this reality model cannot serve as your personal Big TOE until it is based upon your personal experience. On the other hand, personal or subjective experience is only one piece of the reality puzzle. In the objective physical world of traditional science, My Big TOE delivers a comprehensive model of reality that subsumes modern science, describes our objective material reality, and is universally applicable. Contemporary physics is shown to be a special case of a more general set of basic principles. Any major new branch of science must begin its unfolding as a top-down big picture analysis of the pertinent data. New scientific paradigms generally begin at a broad conceptual level and then eventually move, over time, toward more specific applications. Such a top-down process often begins with the discovery of a more general relationship between common objects or events. Typically, the old paradigms become special cases of the new - applicable only under certain conditions. The basic conceptual foundation must be clearly laid-out and thoroughly assimilated before the more traditional bottoms-up scientific approach can be constructed upon it. Only after scientists achieve a certain minimum level of basic understanding can they begin to profitably calculate and experiment their way toward a deeper and more productive knowledge. The point is: The public message of My Big TOE is focused on developing the conceptual foundation upon which a more traditional future science will one day be based. You see, I have not written My Big TOE to frustrate and torture left brained techies with incalculable theory; the time for massive calculation has simply not yet arrived. At this point in the conceptual revolution presented by My Big TOE, everyone can come along on the journey. Scientists have no particular advantage over nonscientists because I have been careful not to couch my descriptions in techno-jargon or to be too techno-boring. In fact, at the front-end of discovery, right brainers, and better yet, whole brainers, have the decided edge in leaping new paradigms in a single bound. Some patience is required. My Big TOE provides a rational, logically consistent Theory Of Everything, develops the required new paradigms to support that theory, constructs a solid scientific foundation for future explorations to be built upon, and explains the interfaces and connections between newly derived knowledge and the existing database of scientific and personal experience. This trilogy subsumes physics, redeems philosophy, and explains many public as well as private phenomena. A broad conceptual top-down exposition of the fundamentals of Big Picture Reality is where this train must start. If and when the Big TOE conceptual brain-train begins to move and pick up speed, it may well initiate the beginning of an independent outpouring of Big TOE science, social science, and philosophy that will begin to take root immediately, and slowly produce fruit over time at ever greater levels of specificity. That is how science moves from concept to application - very slowly, and with casts of thousands. Increment by increment, discovery by discovery - the more people who get involved and apply their brain power, the more quickly the train picks up speed. Section 1 provides a partial biography of the author that is pertinent to the subsequent creation of this trilogy. This brief look at the author's unique experience and credentials sheds some light upon the origins of this highly unusual work. The unusual associations, circumstances, and training that eventually led to the creation of the My Big TOE trilogy are offered to provide a more accurate perspective of the whole. Section 2 lays out and defines the basic conceptual building blocks needed to construct My Big TOE's conceptual foundation. It discusses the cultural beliefs that trap our thinking into a narrow and limited conceptualization of reality, defines the basics of Big Picture epistemology and ontology, as well as examines the nature and practice of meditation. Section 2 logically infers the nature of time, space, and consciousness as well as describes the basic properties, purpose, and mechanics of our reality. Many of the concepts initiated in Section 2 are more fully explained in Book 2. Section 3 develops the interface and interaction between we the people and our digital consciousness reality. It derives and explains the characteristics, origins, dynamics, and function of ego, love, and free will. It derives our larger purpose. Finally, Section 3 develops the psi uncertainty principle as it explains and interrelates psi phenomena, free will, love, consciousness evolution, reality, human purpose, and entropy. Section 4 lays out an operational and functional model of consciousness that further develops the results of Section 3 and supports the conclusions of Section 5. The origins and nature of digital consciousness are described along with how artificial intelligence (AI), as embodied in AI Guy, leads to artificial consciousness, which leads to actual consciousness and to ourselves. Section 4 derives our physical universe, our science, and our perception of a physical reality. The mind-matter dichotomy is solved as physical reality is directly derived from the nature of digital consciousness. Section 5 presents the formal reality model in detail. In this section the mechanics of reality are explained. You will find out how the past present and future are formed, how they can be altered, and how you interact with the larger reality as an individuated unit of consciousness. Here we will explain inter and intra dimensional awareness and probe the theoretical possibilities of teleportation, time travel and a few of the more fun ramifications of this reality model. Section 6 is the wrap-up that puts everything discussed into an easily understood perspective. Additionally, Section 6 points out My Big TOE's' relationship with contemporary science and philosophy. By demonstrating a close conceptual relationship between this TOE and some of the establishment's biggest scientific and philosophic intellectual guns, Section 6 integrates My Big TOE into traditional Western science and philosophy. Modern science and technology are only now providing the combined knowledge by which metaphysics can be understood. It should not be too surprising that science, in its relentless explorations of the unknown, would one day arrive at the roots of existence itself. As it turns out, the nature of reality has both an objective and a subjective component. My Big TOE provides a thoroughly scientific description of an objective Theory Of Everything that covers all aspects of reality in an entirely general way. Additionally, it provides a remarkably practical, personally significant understanding of subjective consciousness, and explains how you individually are related to the larger reality. You will be astounded to discover that My Big TOE has explained, derived, and pulled together, within a single coherent theoretical framework, the best theoretical efforts of contemporary science. This trilogy represents serious science - it builds a logical bridge between physics and metaphysics, mind and matter, normal and paranormal. It delivers a comprehensive first look at a Unified Theory Of Everything - not the way traditional science expected it, but then, if it was the way traditional science expected it, it couldn't actually be a Big TOE, could it? If you want to see the unified Big Picture, you must step out of the conceptual box that limits your understanding and knowledge to what can be derived from only local (little picture) experience. Modern analytical (logic based, not belief-based) philosophers have been hot on the heels of a larger more primary reality that is based upon mind, consciousness, or spirit. They have been much closer to Big Truth for centuries than the scientists but didn't know how to integrate their knowledge with the physical world. These philosophers did not fully appreciate the subjective component of reality, or that subjective information requires an objective assessment before its value can be determined. Without these understandings it was difficult for philosophers to differentiate knowledge from pseudo-knowledge. In an age mesmerized by the results of objective science, narrowly focused critics had little trouble discounting the significance of philosophy's contribution toward understanding a reality defined entirely by physical measurement. A profound understanding of reality, a coming together of science and philosophy, can occur only within the Big Picture. When our understanding is complete and whole, all the puzzle pieces fit nicely together. As long as our understanding remains fragmented by our limiting beliefs, competing culturally correct cliques within the little picture will define and therefore limit our vision of reality. The breakthrough solutions that the scientists and philosophers have been seeking for many decades lie outside the little picture; one cannot get to them without stepping beyond the limitations of a local objective causality. The My Big TOE trilogy fully integrates a subjective, personal, and holistic worldview with objective science. East and West merge, not simply as a compatible or mutually reinforcing mixture, but as a fully integrated single solution. The stunning success of science and engineering in the twentieth century would seem to prove the usefulness as well as the correctness of the materially focused Western view. The result is that many people, whether from the East, West, North, or South of our planet, view reality from an objective and materialistic perspective that often coexists with some culturally based traditional form of religious and social dogma. Thus, a balance, or standoff, between our inner and outer needs evolves into a practical worldview that encourages Western material productivity. A pragmatic materialism that depends on objective causality is used to generate the appearance of a manipulatable, rational, stability on the outside, while a belief-system of some sort provides the necessary personal security on the inside. To eliminate the discomfort of these conflicting worldviews, the two ends of this bipolar conceptual dichotomy are typically kept separate and do not mix or integrate to any significant depth. Each supports the other superficially as they together produce a materially focused, responsible, upwardly striving worker with a good work ethic, cooperative values, an inclination toward dependency, and a high tolerance of pain. A truly Big TOE must explain everything - matter and mind, physics and metaphysics, normal and paranormal - the spiritual as well as the material aspects of existence. An accurate and comprehensive Big TOE cannot help but shed new light upon the theological questions that have gone unanswered for millennia. Though My Big TOE is about science, not theology, it provides a new scientific basis for a grand rethinking and restructuring of fundamental theological concepts. No belief systems of any sort are required to clearly understand what lies beyond physical experience, or why. My Big TOE develops a theory of being that will permanently reorient the ontological and epistemological landscape. With its clear understanding of the origins, nature, and mechanics of consciousness, My Big TOE answers long standing questions of the point, purpose, meaning, and mechanics of existence as well as the significance of human interaction within that existence. My Big TOE approaches these problems and founds its specific detailed solutions on straightforward scientific analysis. No beliefs of any sort and no unusual assumptions are used to unravel the mysteries of being, consciousness, and the larger reality. Truth and Big Truth (relative and absolute truth) are formally and logically defined and differentiated. The fundamental difficulty of separating knowledge from belief is thoroughly explored and a methodology to facilitate the separation process is developed. The My Big TOE trilogy develops a detailed description of the origins of our physical universe within the context of a reality that is much larger than the physical universe. The Big Digital Bang is integrated within a larger picture of existence that clearly answers many of the outstanding cosmological issues concerning the origins of the universe. Our universe is described as one among many local realities within a larger reality system. The nature, origins and mechanics of this larger reality system are clearly and specifically described. 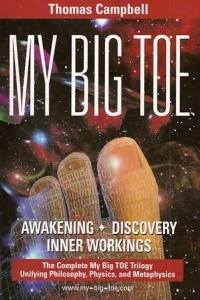 The My Big TOE trilogy develops a theory of consciousness that fully explains and models human experience - all of human experience - normal and paranormal, material and spiritual. The origins, nature, and mechanics of consciousness are described in detail. Consciousness, existence, values, emotion, experience, individual identity and group interactions all are integrated in one comprehensive detailed model of cognitive awareness. This model of consciousness not only accurately describes human consciousness in all its aspects, but also develops the theoretical connection between consciousness, reality, experience, brains, and digital computers. A blueprint for developing artificial or machine intelligence is discussed in terms of consciousness hosted within digital systems. The theory of consciousness and the theory of digital systems are merged to form one unified understanding of the origins, nature, and mechanics of both objective and subjective experience. My Big TOE provides a sound theoretical scientific basis for the paranormal. Paranormal or psi events are shown to be normal events from the perspective of an expanded understanding of reality. Once the nature of reality and consciousness are clearly understood, paranormal events become entirely understandable and amenable to scientific analysis - no beliefs, hocus-pocus, or odd assumptions are required. The apparent problems of measurement within the study of parapsychology are shown to be a function of the experimenter's perspective and limited understanding. The purpose and methodologies for evolving and acquiring individual psi capabilities are clearly described. How the manipulation of psi energy works, its natural limitations, and the mechanics behind psi events are described in detail. Reader's will find out that what we experience as paranormal events within our local (little picture) reality, represents normal energy transfers and well defined scientific processes that obey a higher level (more general) causality within the larger reality. My Big TOE describes the physics of this more general causality and shows the paranormal to be as normal as gravity within its own local system. The allowed interactions between causal systems are described in terms of the psi uncertainty principle. Nothing spooky here - just good science that accurately fits the data and provides parapsychology as well as spirituality with a theoretical basis in hard science. Any successful Theory Of Everything (TOE) must include a thorough explanation of time. Once the larger reality is successfully and accurately modeled, a clear understanding of time falls naturally from that model. What is time? How is it created? Can the future be foretold, can it be manipulated? What are the mechanics behind precognitive dreams? Does the past still live? Is time travel possible? If possible, how can it be accomplished? All of these questions will be answered clearly, unequivocally and in detail. My Big TOE will take you to the beginning of time and far into the future - it will fully explain the origins, nature, and mechanics of time as well as explain the everyday experience of time in technical terms that you can easily understand. Once the larger reality is successfully and accurately modeled, a clear understanding of free will falls naturally from that model. The origins, processes, mechanisms, and limitations of free will are clearly and logically deduced. What is free will? What is its function? How is it generated and maintained? What is its purpose and where does it come from? What is the relationship between free will, consciousness, and experience? All of these questions will be answered clearly, unequivocally and in detail. Additionally, the existence of a deterministic causality within each local reality system is shown to be a requirement of free will and the larger reality system. Albert Einstein began working on a Theory Of Everything (Unified Field Theory) early in the twentieth century. Since that time, physicists have been trying to unify all physical theory under one overarching theoretical understanding with little success. The My Big TOE trilogy will explain why physicists have thus far failed to produce even a little TOE (unifies only the physics of our physical universe), much less a Big TOE (really does explain everything - physics and metaphysics, science and philosophy, normal and paranormal, body, mind, and spirit). Big TOEs are thought neither to exist nor to be within our grasp to formulate or understand. To the contrary, the My Big TOE trilogy derives a comprehensive Big TOE that scientifically and logically makes sense (accurately describes the data) of your total experience - subjective as well as objective. Physics and parapsychology, hard science and philosophy, mind and matter, normal and paranormal, body, mind and spirit - we have always intuitively known that someday they would come together under one consistent understanding - that they are all coherently, purposefully, and logically (scientifically) interconnected within the Big Picture. My Big TOE delivers us to that day. The My Big TOE trilogy introduces several new mathematical concepts. It clearly explains why geometric fractals accurately represent natural objects such as clouds, rocks, landscapes, and mountains. It introduces the concepts of a process fractal (as compared to a geometric fractal) and of fractal ecology. Within My Big TOE, the everyday concept of evolution is generalized and raised to an entirely new level of understanding as it is applied to technology, organizations, societies, economics, governments, and complex systems in general. The evolution of the larger reality and of local reality systems are followed from their humble beginnings to their present states. The concept of ecosystems and ecology within complex interactive self-modifying systems are generalized and raised to an entirely new level of understanding. The concept of ecological interrelated wholeness is applied to consciousness, digital systems, and the greater reality. The My Big TOE trilogy is built upon a theory of complex self-modifying interactive systems. Many of its results are generally applicable to all such systems. In an aside in Book 1, a detailed analysis of the mechanics and function of meditation is offered to help the reader become personally acquainted with his or her consciousness. What meditation accomplishes, how and why it works, and a set of techniques, with instructions applicable to everyone, are described. Once the larger reality is successfully modeled, a clear understanding of the dynamics of consciousness quality falls naturally from that model. Increasing consciousness quality is equivalent to spiritual growth. Thus spirituality becomes an attribute of individual consciousness - a dimension of being. The connection between consciousness, spirituality, psi, love, fear, and human development is logically developed without employing belief systems of any sort. How and why you are connected to the larger reality, the greater significance of your existence, and the purpose of your life are clearly derived from a scientific analysis of the larger reality. The direction and understanding you need to develop to optimize your personal potential is laid out in specific, easy to understand, detail. You will find out unambiguously how you fit into the Big Picture - how you are personally connected to the whole. This page was last modified on 6 June 2011, at 10:34.